If you want to know what green tea extract is, why people supplement with it, and how it can benefit you, then you want to read this article. Green tea extract is simply green tea leaves prepared as a supplement, and it’s high in a class of antioxidants called polyphenols. Green tea extract can accelerate fat loss and improve joint, gut, skin, and heart health, and reduce muscle soreness after exercise. To get the benefits of green tea extract, you want to take 400 to 500 mg per day or drink 5 to 10 cups of green tea per day. The story of green tea extract starts in ancient China. Thousands of years ago, somewhere in the southwest region of China, someone decided to eat the leaves of the Camellia sinensis plant. The flavor delighted him, so he began to tell others about his discovery. It wasn’t long until someone else realized they could use the leaves to brew a delicious drink, and legend has it that this began in earnest 2737 BC, during the reign of Emperor Shennong. Thus, green tea was born. This drink swept through the nation like chain lightning, and caught the attention of Chinese herbalists, who later discovered that it could also benefit our health in many ways. It’s now one of the most popular beverages in the world, but does it live up to the hype? What’s so special about this plant, exactly, and what can it really do for your? And especially its most common supplemental form, green tea extract? Can green tea extract really help you lose fat faster, reduce inflammation, and improve your joint, heart, and skin health? Or is it just another overhyped, underperforming herbal cure all? Well, the short answer is that yes, green tea extract does offer several unique health and body composition benefits, but it’s often overblown by unscrupulous marketers and alternative health gurus. Why Do People Supplement With Green Tea Extract? What Is the Clinically Effective Dose of Green Tea Extract? What Kind of Results Should I Expect With Green Tea Extract? Does Green Tea Extract Have Any Side Effects? Green tea extract is simply green tea leaves prepared as a supplement. Practically speaking, there’s no difference between ingesting green tea extract and drinking green tea. The reason for this is many of the health benefits associated with green tea come from chemicals found in the plant called polyphenols. These are molecules that plants produce to protect themselves against radiation and various disease-causing microorganisms. There are many types of polyphenols, and the green tea plant is particularly rich in one called a catechin. There are several types of catechins, as well, and green tea contains a large amount of the most potent of the bunch, epigallocatechin-3 gallate (EGCG). Most green tea extract supplements contain a small amount of caffeine as well, which is thought to contribute to its health properties. There are decaffeinated green tea supplements, but less is known about them scientifically because the majority of research has been conducted on caffeinated green tea extracts. → How Much Does Caffeine Actually Help Your Workouts? People take green tea extract to improve both their health and body composition. Research shows that green tea extract can actually deliver on (some of) these hopes. Green tea extract has been studied for several decades now, and we’ve learned quite a lot about how it affects the body. Let’s review the highlights one by one. The main reason people supplement with green tea extract is to increase fat loss. And HOORAY because it does indeed do just that. How much it ultimately helps, however, is unclear. For instance, when a team of researchers from Dalhousie University looked through all of the studies on green tea extract and body composition available that lasted at least 12 weeks, they found that it caused anywhere from 0.5 to 8 pounds of weight loss over the course of the trials. In other words, some people experienced very little additional fat loss with green tea supplementation, and others experienced quite a bit. Why the wide range of results? The researchers aren’t exactly sure, but they think that some people simply respond better to it than others. To understand why this is the case, you first need to understand how green tea extract stimulates fat burning in the body. To release fatty acids from fat cells so they can be burned for energy, your body produces chemicals called catecholamines. Catecholamines also increase your metabolic rate, which helps you burn more calories and improves mood and alertness. To bring catecholamine levels back down, your body produces an enzyme called catechol-o-methyltransferase (COMT). The higher COMT levels are, the lower catecholamine levels will be, and the less fat and calories you’ll burn. Green tea extract blunts the effects of COMT, which allows catecholamine levels to remain higher, helping you burn more fat and calories. The catch, however, is that green tea extract affects COMT differently in different people. In some people, the effects are marked and so is the increase in fat burning, whereas in others, the effects and benefits are negligible. For example, people of Asian descent generally respond better to green tea extract than us round-eyes, and thus lose more fat when supplementing with it. Habitually consuming more than 300 mg of caffeine per day is enough to start building a tolerance, and significantly decrease its effectiveness. As your body becomes more tolerant to it, it also becomes less responsive to the fat-burning effects of green tea extract. On the one hand, if you don’t have the right genetics and regularly consume a lot of caffeine, then green tea extract may not help you lose fat faster. On the other hand, if you have the right genetics and regularly consume a low to moderate amount of caffeine, then green tea extract could help you lose fat significantly faster. Most people will fall somewhere in the middle here–not hyper- or hyporesponsive, which means you should expect green tea extract to help you lose at least a few more pounds of fat during your cut than you would without it. And if you want to make it as effective as possible, then make sure to limit your caffeine intake to less than 300 mg per day. You’ll also want to consume the proper dosage of green tea extract for fat burning, which is 300 mg per day or at least three servings of green tea per day. Losing weight is great and all, but the ultimate goal isn’t just to lose fat—it’s to lose it and keep it off. Proper diet and regular exercise are the keystones here, of course, but research shows that green tea extract can help too (and for the same reasons it can help you burn fat faster). Proof of this idea comes from a study published by a team of researchers at Maastricht University. The researchers wanted to see how supplementing with green tea extract affected weight loss and weight loss maintenance. To do this, they reviewed 11 randomized controlled trials (the gold standard of research) that lasted at least 12 weeks, and after parsing through the data, they found that people who took green tea extract after losing weight were more successful in keeping it off than people who didn’t. In other words, the green tea extract helped them maintain their new, lower, post-diet weights. But wait, you might be thinking, shouldn’t you stop taking fat loss supplements after your diet is over? Yes, you should eventually stop taking them, but I think it’s sensible to continue while you’re reverse dieting. Check out the article below to learn how this is done. Oxidative stress refers to cellular damage caused by free radicals in the body. Some oxidative stress is necessary and even beneficial, because the damage caused by free radicals encourages the body to adapt to better handle such situations in the future (this is one of the ways exercise makes us healthier). Under healthy conditions, your cells get just enough oxidative stress to thrive, but not so much that they suffer permanent damage. Problems arise, though, when oxidative stress remains too high for too long due to various things like psychological stress, overtraining, or lack of sleep. If this condition persists, the risk of developing many types of disease rises sharply, including cancer, diabetes, and cardiovascular, neurological, and pulmonary diseases. One solution is the antioxidant, which is a special type of molecule that neutralizes free radicals in the body, and thus can improve your health and performance in many ways. The polyphenols in green tea extract are powerful antioxidants, and this is why studies show they can significantly decrease markers of oxidative stress in the body. This is true even in otherwise healthy people who are following an intense training program (not just the sick and elderly). A good example of this comes from a study conducted by a team of scientists at the Jozef Pilsudski University of Physical Education in Warsaw. One group took placebo supplements. Everyone followed their normal diet and training routines for eight weeks, and then came into the lab to do a difficult high-intensity interval workout. The researchers measured power production during the tests, and took blood samples to measure oxidative stress levels. They found that the people who had been taking the green tea extract supplements showed significantly lower levels of oxidation after their workouts than the people who took the placebos. The green tea extract didn’t improve performance in this study, but it did seem to improve markers of muscle recovery. If the athletes used that extra recovery capacity to train harder, it’s possible they would also see a gradual improvement in performance over time. Many people claim that drinking green tea helps reduce their joint pain, and now science shows they may be right. For instance, studies on small groups of human cells (in vitro research) have found that green tea extract can reduce inflammation, and one study on rats also showed that green tea extract reduced symptoms of arthritis. What about us humans, though? Well, the only study we have on this so far was conducted by scientists at Shiraz University of Medical Sciences. They found that people who took green tea extract in addition to diclofenac (a common NSAID used for joint pain), experienced less pain and greater mobility than people who only took the diclofenac. Although this isn’t perfect evidence by any means, it does indicate that green tea extract may indeed help reduce joint pain and improve joint function. That’s why I included a clinically effective dosage in my joint health supplement Fortify, which you’ll learn more about in a moment. Green tea extract has been shown, in vitro, to kill bacteria and viruses. Does it work in humans, though? Well, no studies have shown it works directly, but it might work indirectly by positively influencing your gut health. For instance, one study found that drinking just two cups of green tea per day can reduce the production of inflammatory compounds called lipopolysaccharides, which are normally associated with infections. Green tea also increased the production of short chain fatty acids (which support gut health). This is likely thanks to both the EGCG and other compounds in green tea breaking down into other compounds that can suppress what we generally call “bad” bacteria. By keeping these bad bacteria at bay, the good bacteria is able to flourish, which decreases the risk of a number of illnesses like heart disease, obesity, and many kinds of infectious disease. Green tea is also unique among antioxidants, because it can reduce markers of inflammation while simultaneously supporting the activity of immune cells. (One of the other few supplements that can do this is spirulina). Normally, antioxidants and anti-inflammatory supplements reduce the activity of immune cells, which could theoretically reduce your ability to fight off infections. Green tea extract, on the other hand, gives you the best of both worlds. There’s strong evidence that green tea extract may reduce your risk of heart disease. To understand why and how, you first need to understand the main factors that contribute to heart disease. At the top of this list is your blood level of cholesterol. Cholesterol is a waxy substance present in all cells of the body that’s used to make hormones, vitamin D, and substances that help you digest your food. It’s delivered to cells by molecules known as lipoproteins, which are made out of fat and proteins (hence the name, now you know Latin!). There are several different kinds of lipoproteins, but the main ones involved in this process are called low-density lipoprotein and high-density lipoprotein. Low-density lipoproteins, or LDL, is often called “bad” cholesterol because high levels are associated with cardiovascular disease and most “heart healthy” advice suggests limiting foods that increase LDL. High-density lipoprotein, or HDL, is associated with a lower risk of heart disease, and high levels are generally considered a sign of good heart health. The reality is a little more complex—neither kind of cholesterol is completely bad or good—but you generally want LDL cholesterol levels to be lower rather than higher, and you want your HDL levels to be higher rather than lower. Studies show that green tea extract reduces LDL cholesterol and increases HDL cholesterol levels, but it looks like this effect only occurs in people who already have high LDL and low HDL cholesterol. If you’re already healthy, you may not see much or any benefit. That said, green tea extract also improves blood flow and reduces blood pressure, which are two changes generally associated with improved heart health. This is probably thanks to the way green tea extract effects nitric oxide levels in the blood. Nitric oxide is a gas that your body releases into the blood to relax your blood vessels, which improves blood flow and reduces stress on your heart. As a rule of thumb, strong antioxidants that hang out in the blood can improve nitric oxide signaling. When you consume things like grape seed extract or green tea extract, which are filled with these kinds of antioxidants, more nitric oxide is produced and blood flow improves. Your blood glucose, or blood “sugar” level, refers to the amount of glucose floating around in your blood. When blood sugar levels rise too high, your risk of developing diabetes increases. When they fall too low, you can suffer symptoms like headaches, fatigue, and fainting. Your blood sugar levels are largely held in check by a hormone called insulin. Insulin is created and released into the blood by the pancreas, and its main job is shuttling glucose and other nutrients into cells so it isn’t cluttering up your bloodstream. Your body takes care of all of this easily and automatically most of the time. Problems occur, though, when your BMI rises to unhealthy levels or you don’t get enough sleep or exercise. And in these cases, green tea extract may be able to help keep blood glucose and insulin levels under control. The most convincing piece of evidence of this comes from a study conducted by a team of scientists from the University of Southern California Keck School of Medicine. One group consumed 800 mg of green tea extract per day. One group consumed 400 mg of green tea extract per day. One group consumed a placebo. Everyone followed this regimen for two months, and the scientists took blood and urine samples and a variety of other measurements throughout the study. In the placebo group, insulin and glucose levels rose slightly, whereas they dropped slightly in the green tea extract groups. The differences weren’t huge, and the scientists weren’t entirely sure why or how this occurred, but the answer may have something to do with an enzyme called AMPK. AMPK pulls nutrients into cells and out of the blood stream, which reduces the amount of insulin your body needs to produce to maintain healthy blood glucose levels. Most supplements and drugs, like berberine and the pharmaceutical Metformin, work by activating AMPK. It turns out that green tea extract also activates AMPK, and it’s possible this is why it helped keep insulin and blood glucose levels in the proper range in this study. So, while green tea extract is no replacement for diet and exercise, it may help keep your insulin and glucose levels under control. → 13 Studies Answer: What’s the Best Way to Lower Blood Sugar? There are only a handful of supplements that can improve your skin health, and green tea extract is one of them. It increases blood flow and oxygen delivery to the skin, which may help improve skin cell health. It increases the antioxidant capacity of the skin, which can help protect skin cells against harmful UV radiation, which is associated with skin cancer and aging. It’s impossible to tell how much of a benefit you can expect here, but at the very least it’s another good reason to drink green tea. When you lift weights, you cause microscopic tears in the muscle fibers. For the most part, this damage is a good thing because it causes your body to adapt and grow bigger, stronger, and better able to deal with future bouts of training. If you cause too much damage, though, your body can fall behind in recovery and you can start to develop signs of overtraining. Green tea extract strengthens our bodies’ antioxidant defense systems, and this reduces the amount of damage and oxidative stress caused by exercise. And one of the most immediate and obvious signs of this is a reduction in muscle soreness after exercise. Delayed onset muscle soreness (DOMS) is the muscle soreness you feel after a workout and it’s both annoying and a major limiting factor in how much muscle and strength you can gain after a workout. By reducing the amount of DOMS you generally experience, you can progress faster in your workouts, and especially on heavy, compound exercises, like the squat, deadlift, and bench and overhead press, and that can lead to more strength and muscle gain over time. The clinically effective dose of a substance is the amount that produces the desired response or effect. In the case of green tea extract, it works in a dose-dependent manner, which means that the more you take, the more benefits you’ll see (up to a point, of course—there’s a maximum healthy intake level that you shouldn’t exceed). The beneficial effects we’re after occur at doses of about 400 to 500 mg of EGCG (the most important catechin in green tea extract) per day. To get the same benefits from tea, you need to drink about 5 to 10 cups of green tea per day. (A cup of green tea is the equivalent of around 50 to 100 mg of green tea extract). If you’re excited about green tea extract, I understand. There aren’t many natural supplements that are scientifically proven to help your body in so many different ways. That said, it’s not a miracle pill. Remember that some of these benefits only apply to certain people and circumstances. For example, if you’re already lean and active, you probably won’t notice any changes in your cholesterol or glucose levels after taking green tea extract. That said, given how many benefits green tea extract offers, it’s likely you’ll experience some positive benefits no matter your body composition, diet, and lifestyle. These side effects tend to occur only in individuals who have a low caffeine tolerance, so if that’s you, get a decaffeinated green tea extract and you’ll be less likely to experience adverse effects. You should also check with your doctor before supplementing with green tea extract if you’re pregnant, breastfeeding, taking medication, or have a chronic illness like arthritis or type ll diabetes (just to be safe). You now know why green tea extract is extremely popular and found in many pre-workout and fat burner supplements. Supplements don’t build great physiques. Proper training and nutrition does. And that will never change. Supplementation will never overshadow exercise and diet. That said, there are safe, natural substances that have been scientifically proven to boost fat loss and improve your general health and well-being. If you know how to drive fat loss with proper eating and exercise, then certain supplements can help speed up the process. And as you now know, green tea extract is one of the few worthwhile supplements (yohimbine and synephrine are two others). If you want to get the most out of it, though, you need to know a few things. First, some green tea extract supplements contain just that—powdered green tea leaves—while others contain an isolated form of one or more catechins. You can go with either, but you want to pay special attention to the EGCG content, because that’s the molecule most associated with green tea extract’s weight loss and health benefits. Unfortunately, the quality of green tea extracts varies wildly so some contain very little EGCG while others contain a fair amount. A good green tea extract supplement will contain at least 45% EGCG by weight. You can also supplement with pure EGCG, which is what I do, and save money by reducing the amount of pills you have to take to reach the clinically effective dosage required to see benefits. That’s why I chose to include pure EGCG in my fat burner Phoenix as opposed to a green tea extract powder. It increases your metabolic rate. It increases both basal metabolic rate and lipolysis, inhibits the activity of certain fat cell receptors that prevent fat mobilization, and increases the thermic effect of food (the “energy cost” of metabolizing food). Naringin is a type of molecule known as a flavonoid and is found in grapefruits, oranges, and the skin of tomatoes. Research shows it stimulates the production of a hormone called adiponectin, which is involved in the breakdown of fat cells and activates a receptor in fat cells that regulates fat mobilization (the PPARα receptor). Through these mechanisms, naringin also works synergistically with synephrine and hesperidin to further boost your metabolism. Hesperidin is very similar to naringin. It’s flavanoid found in the same fruits, and it also stimulates the production of adiponectin and activates the PPARa receptor. Studies show it improves blood flow and reduces inflammation in blood vessels, too. Research shows it increases blood plasma and intracellular levels of a molecule known as cAMP. When cAMP is high, it signifies a lack of ATP (the most basic form of cellular energy in the body) and thus initiates a process to make more ATP by burning through energy reserves (body fat). This is why studies have found that forskolin can accelerate fat loss and, interestingly, increase testosterone levels as well. The bottom line is if you want to lose fat faster without pumping yourself full of stimulants or other potentially harmful chemicals … then you want to try Phoenix today. Green tea extract is one of the few supplements that can improve both your health and body composition. It’s not going to change your life, of course, but green tea extract will help you get the body you want a little faster. 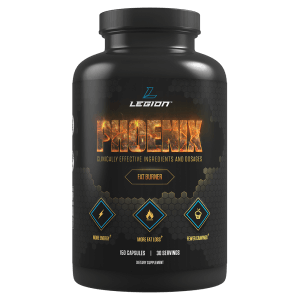 If you want to see for yourself, and you want to try a potent, safe, and properly dosed green tea extract supplement, then I suggest you try Phoenix today. What’s your take on green tea extract? Have anything else to share? Let me know in the comments below!